The TWU has criticised an announcement by Deliveroo on share bonuses for senior employees, which excludes the company’s delivery riders. Food delivery riders will today tell an annual review of wages that deliberate system avoidance has means thousands of riders around Australia are not covered by the Fair Work Commission minimum standards. Leaked emails from Foodora management reveal internal concerns that the food delivery platform is engaging riders on sham contracts and is exposed to legal action that could have a "devastating", domino-like effect on the business. 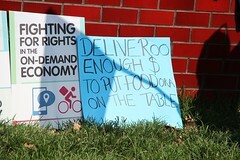 The Transport Workers’ Union is calling on the Federal Government to regulate food delivery companies after internal communication at Foodora shows the company admits it could be engaging in ‘sham-contracting’.